SBS’ period drama “Scarlet Heart: Ryeo” is nearing the half way mark with episode 10 scheduled to broadcast on Monday. 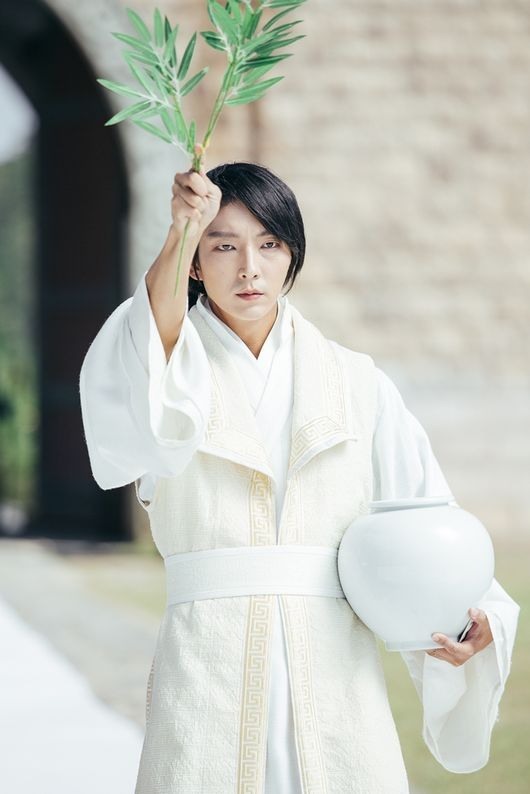 To celebrate the halfway mark, SBS has released an interview with actor Lee Joon-gi who plays the 4th prince, Wang So. Q: The ritual scene in the rain has stirred a buzz among viewers. What were your thoughts when you were acting it? I thought that it would be a pivotal scene in Wang So’s character change. I wanted to show how Hae-soo allowed him to break out of the cold exterior that he suppressed himself in and overcome the scar that had tormented him. I tried to act in a way that showed his emotional development as he addressed his people. Q: The ritual scene truly is a groundbreaking scene. What do you think? I’m relieved and glad that its being received so positively. I knew it would be a big twist in the story, but I had no idea it would be such a hit. The scene really worried me because I had to portray an ancient character in a way that wouldn’t disrespect the historic significance. Q: Your character’s relationship with Hae-soo is really unique. What are Wang So’s feelings for Hae-soo. She is the only person that saw him for what he truly was. He’s also most honest when he’s around her. She’s somebody that he wants to protect, and he feels he is being protected by her as well. She’s the first person that has treated him kindly and warmly so his feelings for her are becoming more and more pronounced. Q: Your chemistry with Wang Wook’s actor Kang Ha-neul is also getting a lot of attention. Your characters are the same age, so how does that affect the relationship between So and Wook. Wang So thinks that Wook understands him. Among all his other brothers, he feels that he’s closest with Wook and so when he said “there’s nothing that’s yours here. She is all mine,” my character had to try really hard to hide his shock. They might see the same things, but they look at it differently, so it adds an interesting dynamic to the characters. Q: Which viewer reaction was the most memorable? When I had to take off the mask and show the scar, I was worried that viewers would be turned off by it, but instead they didn’t even think it was important at all and sympathized with my character. I was really grateful, because what used to be significant is not anymore so it shows how the viewers have become more accepting. Whats important is the character, not what he looks like. That’s the kind of actor I want to be as well. Q: “Scarlet Heart: Ryeo” is not only popular in the Middle-East but also in North America. What are your thoughts on that? I’m extremely grateful. Every culture is different and they have different tastes. I’m glad we satisfy their tastes, and it also really interests me. When I read feedback and encouraging comments on my social media, I feel like I want to be a better actor. Q: What should we look out for from Wang So? From being the most neglected prince, Wang So suddenly becomes the center of attention. He was a self-conscious and introverted boy before but now he’s gonna show a more strong and assertive character. He will tackle betrayal, jealousy, romance and more so keep watching!